•Adventurer™: The Adventurer is affordable, accurate and easy to use for all of your basic weighing needs. •Adventurer™ Pro: Adventurer Pro balances are ideal for general laboratory, industrial and educational applications requiring multiple weighing units. 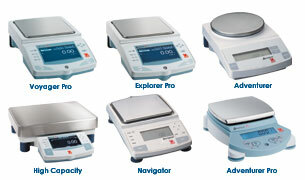 Adventurer Pro balances are the economical way to weigh with precision. •Explorer® Pro: The Explorer Pro is the perfect choice for users who demand high performance in a dependable, easy-to-use workhorse balance. Legal For Trade models available. •Navigator™: The Navigator offers you all the power of a laboratory balance in a portable unit with parts counting, animal, percent and check weighing applications. •Voyager® Pro: Voyager Pro's advanced applications simplify complex laboratory measurements and help reduce errors in manual calculations.